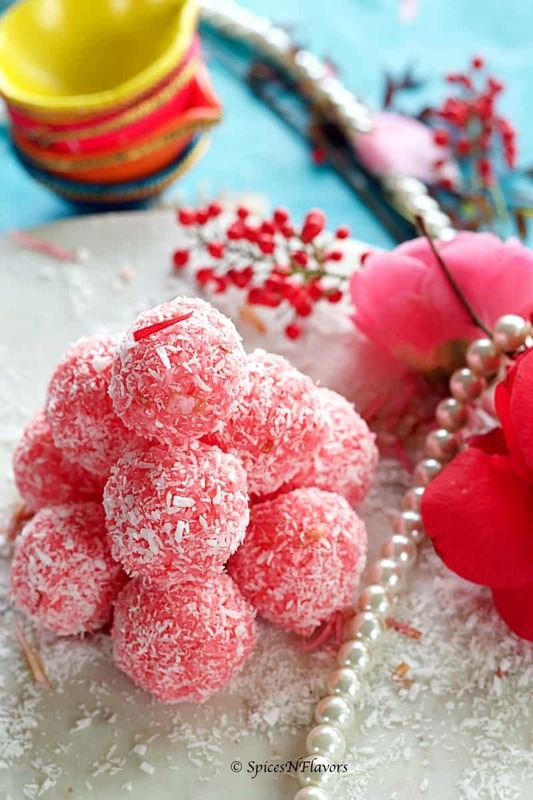 Rose Coconut Laddu – A classic combination of rose and cardamom made in the form of laddu for this festive season. 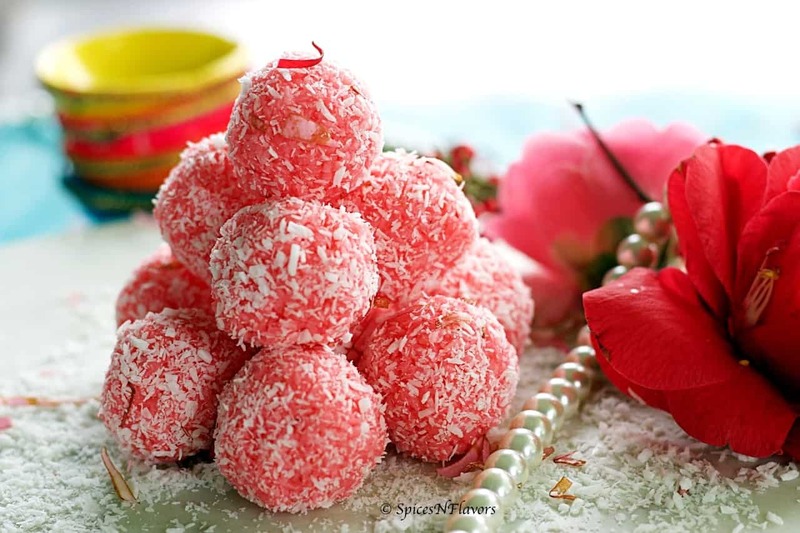 Rose Coconut Laddu is by far the most easiest recipe I have made. Yes I have made simple recipes like this 3 ingredient Chocolate Pudding or 3 ingredient Eggless Nutella Cookies. 4. 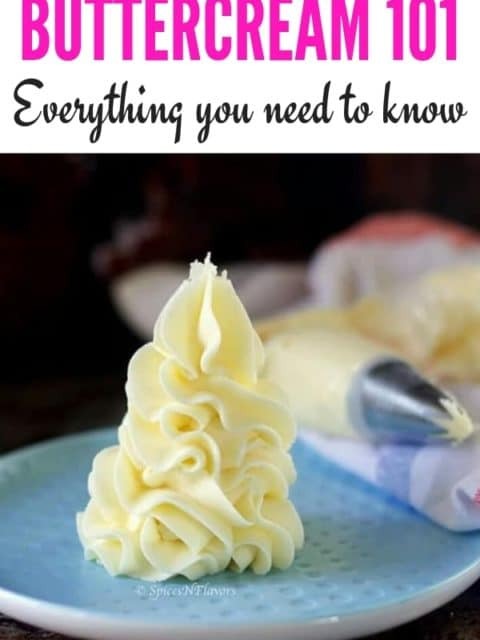 Can be made with ‘n’ no.of flavours. This Rose Coconut Laddu is inspired by my No cook Instant Barfi.. Well actually there is not much difference between the two recipes.. This is ofcourse a flavoured one and thats plain. I am always in the lookout for simple and quick recipes; what could be better than a laddu for this festive season. 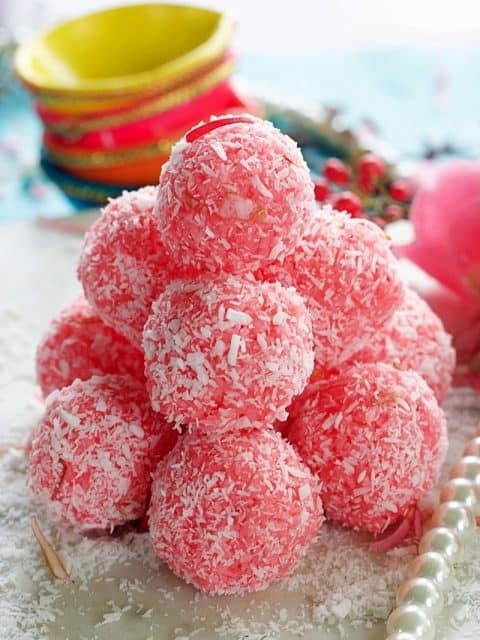 Rose Coconut Laddu as the name suggests is basically a coconut laddu flavoured with rose water. Instead of rose water you can also use rose syrup or even Rooh-Afza. Some flavours are like a match made in heaven like Apple and cinnamon; Blueberry and lemon; so is this Rose and Cardamom. Its such an aromatic combination. We absolutely loved it. I have used desiccated coconut but you can also use fresh coconut in this recipe. This is an instant no cook recipe; so if you use fresh coconut then you might have to roast it a bit on the gas stop to remove the moisture or you can use it directly also but grease your hand really well with ghee to avoid the coconut sticking to your hands. If you happen to try this recipe then do tag me, tweet me or instagram me; I would love to follow you and your posts. 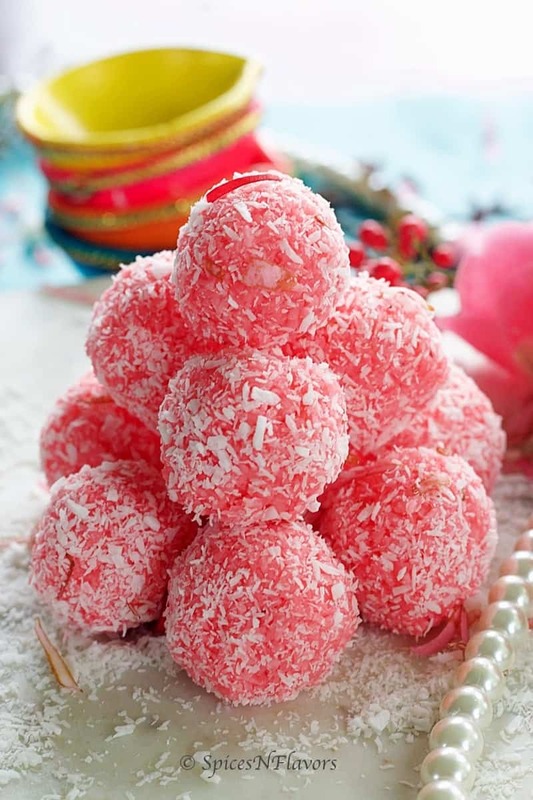 Rose Coconut Laddu is a no cook instant version of coconut laddu flavoured with rose and cardamom. 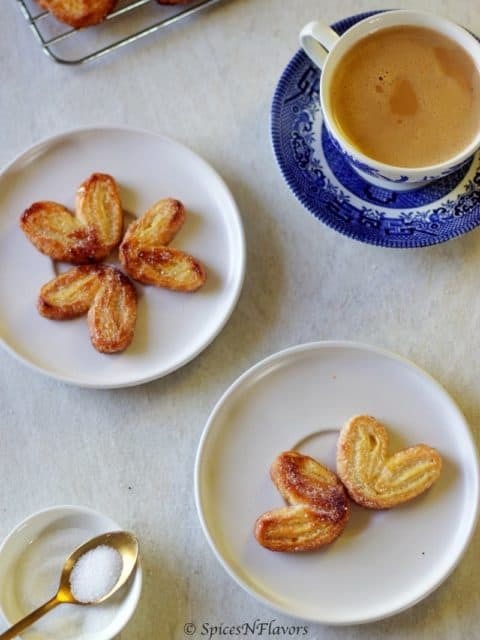 In a bowl, combine together coconut, condensed milk, rose water and cardamom powder and mix until everything comes together. Grease your hands with some ghee; take small portion out of the above mixture and roll it in between your palms to make roundels or balls or what we call laddu. 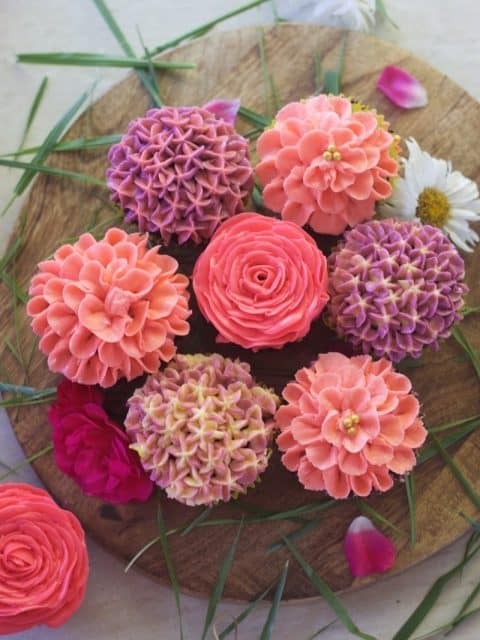 Spread some coconut and rose petals onto a tray. Once all the mix is used up, roll them up in the coconut mix to coat the balls. 1. You can use rose syrup or Rooh Afza instead of rose water. 2. If you are using fresh coconut you may want to roast it for a minute or so however this step can be skipped too. Anything with coconut sounds good to me! This one is sensational. Indeed you must give this a try.. thank you and also you can stuff some pistachios in the center if you wish to that would be one interesting combination – Rose and Pistachio is one ultimate combination. Did you use rooh afza or rose water? If using rooh afza…is it same quantity as rose water? Nice recipe. Can I use evaporated milk instead of condensed milk. If so than what extra step I have to follow? Condensed milk not only adds as a binding agent but it is also the factor that sweetens the laddu whereas evaporated milk has no sweet content so even though it will bind everything you will have to add some sweetener may be you can try adding powdered sugar because if you add regular sugar you will get a bite of which won’t be good to taste.